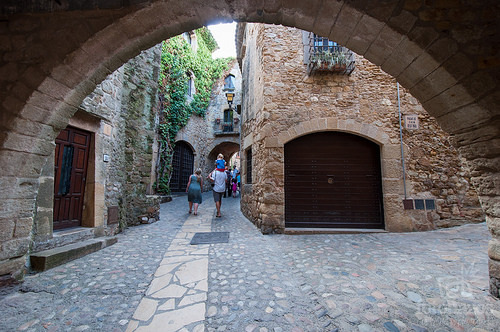 A charming medieval town complete with cobblestones streets and a semi-circular Romanesque clock tower with its own Platja meaning beach a few kilometres away on the Costa Brava coastline. 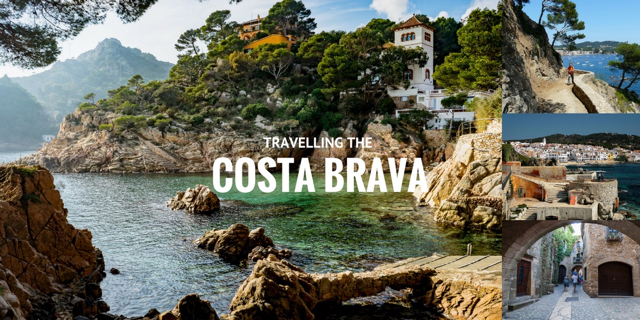 A great place to start exploring this section of Costa Brava. After you’ve spent some time on the beach, you might want to try a local rice dish and taste the local ‘arroz de Pals’. Both Pals and Begur (next) are part of the Cittaslow movement which centres on SlowFood and promoting a sustainable quality of life. Sounds like the perfect antidote after a few days in Barcelona, doesn’t it? Best known today for its many coves and beaches although keen walkers will know Begur is also the name of the nearest mountains – the Begur Massif. 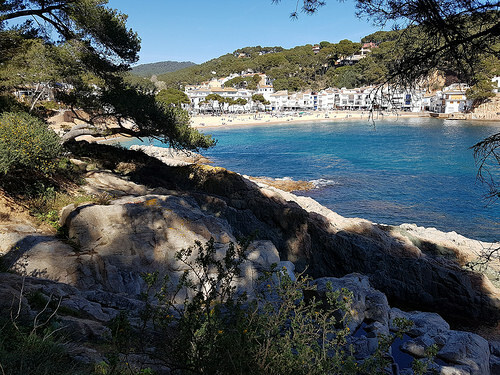 You have eight coves and beaches to choose from here: Platja Del Raco (alongside Pals), Illa Roja, Platja de sa Riera, Aiguafreda, Sa Tuna, Platja Fonda, Fornells and Platja d’Aiguablava and each of these is prettier than the previous one. In the town itself, Begur Castle is worth a visit for the views of the coastline alone. As you walk around the medieval town, you’ll see many colonial houses dating from trading connections with Cuba – if you are here the first weekend in September, you’ll have the Fira d’Indians to help you grasp the history a bit better. Otherwise you can grab a drink or a bite to eat at one of these ‘casas indianas’. If you like diving, you’ll find many companies offering trips and equipment rental all along this coastline. For a room with a view, the Parador overlooking Aiguablava (perched amid the cliffs of Punta d’es Muts) is one of the ‘modern’ builds and you’ll be blown away by the views of the cliffs and beaches. Another of this coastline’s enviable and more exclusive coves is the Platja de Tamariu – nestled in the tamerisk-forested hills around the bay. It’s a true Mediterranean classic complete with boats bobbing in the crystal-clear water. There are four coves to choose from: – Liris with its centenary drystone hut, the rocky Aigua Dolça Cove, the pretty cove of Aigua Xelida and Cala Pedrosa, where there is also another stone hut. Choose a section of the beach or explore the white-washed town and have a drink on one of the many terraces overlooking this coastline. Every year, on 15 August the fishing town celebrates the fiesta of Santa Maria with music, dance and lots of family activities including treasure hunts and foam fights. If you are here on the first Saturday in September you’ll get to hear ‘Habaneras’ being sung on the main beach. The Telegraph describes this place as being “perfectly proportioned” saying that “outside the chaotic but short-lived high season (July and August), you’ll hear little more than the birdsong and the waves lapping on the rocks.” We couldn’t agree more and recommend a visit to this small bay and marina which is perfect for a seafood platter and a glass of wine. 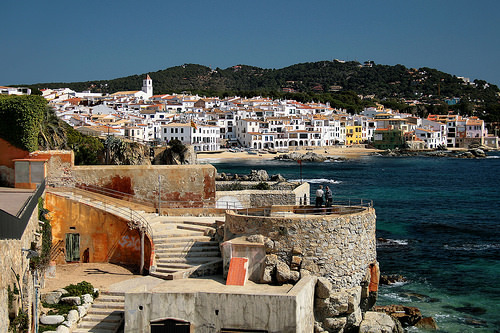 From here you can carry on by car or park up and talk a walk or cycle along the coastline to Calella de Palafrugell. The best-known section of all this coastline, it’s the perfect combo of picturesque port meets sunny beach. Because it’s a little larger than the other places we’re covering here, you’ll find a greater selection of accommodation, restaurants, bars and cafes. If food is a vital part of your stay, perhaps you should try to coincide with La Garoinade, the town’s sea urchin festival. You can read all about these delicacies in this New York Times article. If gardens are more your thing, then check out the 17 hectares of the Cap Roig Botanic Gardens created on the estate purchased in 1927 by the Russian Colonel Nicolai Woevodsky and his English wife, the aristocrat Dorothy Webster. Every Summer, these very gardens welcome the Cap Roig Festival with its open-air stage playing host to the world’s best musical artists in this spectacular natural setting overlooking the Mediterranean. 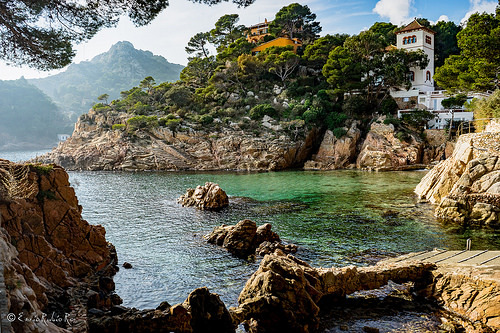 This wonderful coastal camino or footpath stretches from St. Feliu de Guíxols to Begur (43km) although you can just pick up the route wherever you like. 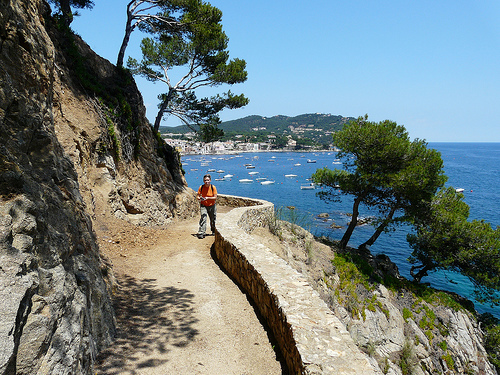 We recommend the final 12km from Calella de Palafrugell to Begur which takes in many of the coves we mentioned above. You can also do a circular route which is much longer (140-km) but you’ll probably need to have some proper walking gear with you for that. If you’d like to take on a walking or cycling route in this area, and if you book your trip through us, we’ll be able to advise you on the best section for you and your group depending on the time of year you are travelling. 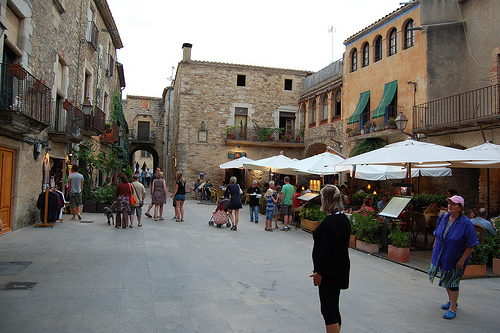 The capital of Baix Emporda is another great place for a stroll and a drink or a bite to eat. 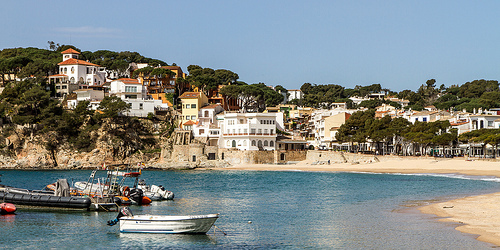 It’s just a 20-min drive from Calella de Palafrugell – but it feels like you are crossing date-lines. Visit the castle-palace from the 11th century where the bishops of Girona resided – and if you’re here on a Friday, you’ll find the weekly market running throughout the old quarter with over one hundred stalls selling food, clothing, ceramics and jewellery. 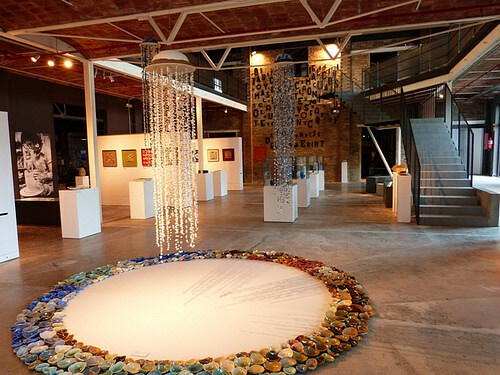 La Bisbal d’Emporda is well-known as one of the leading pottery centres in Catalonia, so you might want to pick up some pottery here and visit the Terracotta Pottery Museum, located in a former factory. Around Eastertime, the town holds an antiques and craft fair and later, in September, the Vintage Toy & Collectables Fair is held. We are big fans of Besalu which we’ve already included in our Guide to Significant Jewish Sights and our Guide to the Best Bridges. It’s an hour’s drive from the coast and just 30 mins away from Girona. 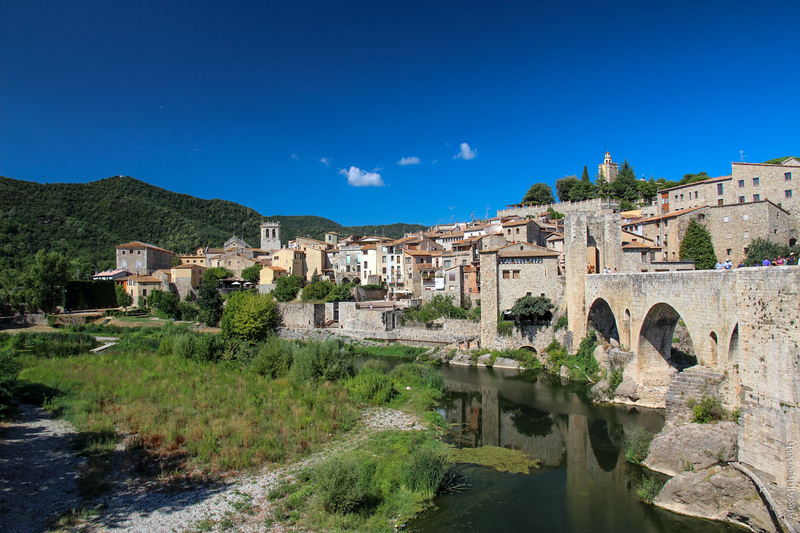 Why do we recommend medieval Besalu? The 135m long Romanesque bridge is pretty amazing. In the town itself, among the cobbled and arcaded streets and squares, you’ll find the 10th century Benedictine Church of San Pere and the 12th century Jewish mikvah, a ritual public bath, one of the only three from the same period in all of Europe. And if you still have time left over, visit the Miniatures Museum where you’ll need the magnifying glass provided to find the art – never mind the brush strokes! Today it’s synonymous with the Michelin-starred Celler de Can Roca restaurant but there’s lot more to see and do in Girona. If you’ve been to Besalu, you might want to explore the Jewish Quarter, which is where many Jewish families from Besalu migrated. You can visit the Bonastruc Ca Porta Centre, which recreates Jewish life through art exhibits, musical events and food tastings. The city walls are also pretty impressive and no visit to the city is complete with a walk alongside the river to admire the colourful facades of the Onyar houses. If you like ice-cream, check out the parlour called Rocambolesc run by Jordi Roca, of Celler de Can Roca fame – keep an eye out for Jordi who has been known to serve his ices himself from behind the counter! 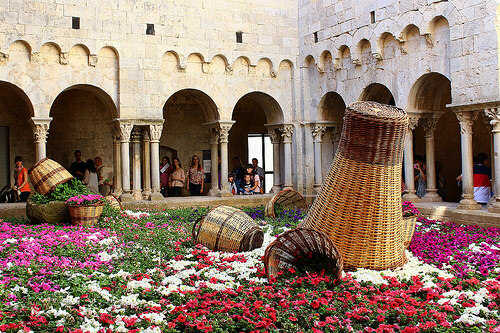 And as you can see above – the annual Flower Festival held every May is a great time to visit Girona! 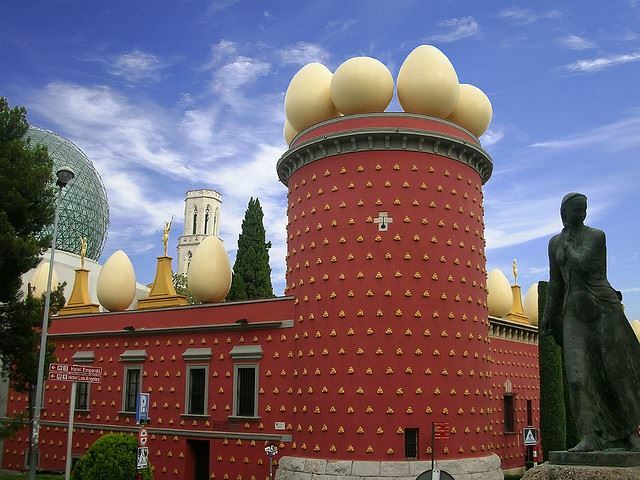 The birthplace of the artist Salvador Dalí in Figueres is only an hour’s drive north of Calella de Palafrugell. You can visit the Dalí museum to see many of his most iconic works and explore the space that was designed by the artist himself. In fact, it was so close to his heart that he chose to be buried here in the crypt. After visiting the museum, drive on another 40km to the coast to Portlligat near the beautiful fishing town of Cadaques to see the home where Dalí lived until his muse Gala died in 1982. Pre-booking is essential to access the house which is full of personality, charm and wit. We enjoy spending time in the studio where Dalí worked and the sculptures in the garden are also well worth seeing. To learn more about where to experience Dali in this area, including Gala’s castle in Púbol and the Cap de Creus, you can read our Guide to Dali’s Catalonia. It’s not advisable to try to see more than two of the Dalí sights in one day but if you want to pack a lot into one day, we recommend hiring the services of a private guide and driver who can help you navigate the roads and the artwork to ensure you get the maximum from your time in this area. Posted in Active breaks, Catalonia, Dalí, Popular Posts and tagged Begur, Besalu, Cadaques, Calella de Palafrugell, Cami de Ronda, Figueres, Girona, La Bisbal d'Emporda, Llafranc, Mediterranean, Pals, Peratallada, Port Lligat, Tamariu.